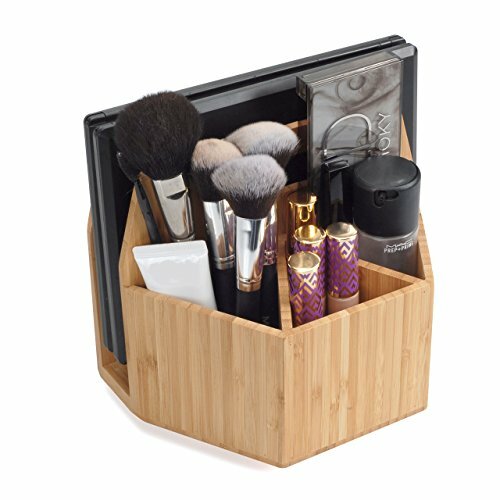 Get ready fast with the MobileVision Rotating Makeup Caddy Organizer. A deluxe 5-compartment stand that can rotate a full 360 degrees, which makes it easy for you to find and store your daily products. Keep your concealers, powders, shadows, brushes and more at your fingertips. Easy to clean with enough space to hold and organize your favorite make up products. No need to stop the flow of inspiration when everything is easy to find and readily available. Add this caddy to your vanity, dresser, or bathroom countertop. Multi-purpose with a sleek design that blends with any décor. Store in kitchen to help organize utensils, plates, napkins, sauces and more. Keep on your coffee or side table in your living room for storing remotes, phones, puzzle books and daily newspaper. Display it on your desktop to create organization for pens, pencils, notepads, cell phone and other office supplies. If you have any questions, or encounter a problem with the appearance or function of our products, please contact us directly. We are committed to resolving any situation in which our product does not meet your expectations. We offer a one year warranty replacement for quality issues and a 30-day hassle-free replacement or return within 30 days of purchase. For more details on our refund / return policies please contact us @ 888-628-9300 or email us @customerservice@cesupply.com. (M-F, 9am - 5pm PST). Multi-Purpose and Mult-Functional - Great for organizing kitchen utensils, plates and napkins, make-up, pallets, tools, coffee table essentials, desk top supplies and bathroom. Please refer to image for compartment dimensions.